"We care when you can't be there ..."
The Senior Care Advocates vision is to provide services that keep people independent and useful for as long as possible. It’s the kind of life I want for myself. Sometimes it just takes a little help to achieve that goal. Rarely does anyone think it’s appealing to have someone else in their home all day…..how can you possibly relax and be yourself? But, a little help that will keep me safe in my own home IS acceptable. Someone who hears better than me, is a safer driver, can take notes for my family or just help me get to lunch with my friends. The mature staff at Senior Care Advocates has “been there and done that…” either with children, parents or grandparents of their own. They offer the unique perspective of experience, patience, dependability and knowledge that guides them in treating their clients like family. We invite you to call for a no-charge at home chat about how we can help you or your loved one improve their life. We are there when you can’t be. I was recommended to Benita by my trust officer. She has helped me get my life back together. She is so non-judgmental it made it easy to work with her. I now have a budget, a driver’s license, a car, all my debt is paid off and I have a part-time job. I am well on my way to being independent again! My Dad’s elder care lawyer suggested I speak with Benita about help for my dad. I live in South Carolina, and Benita was very helpful when he needed to move from independent to assisted living. She also converses with his doctors and the nurses on staff where he lives. She has managed to reduce both his cable and cell phone bills, and reviewed his medications with the right doctor to ensure he was not overmedicated. It has been difficult to watch my Dad’s condition worsen, but it helps knowing I have someone right there in St. Louis to keep me informed. Your Mom has been independent and handling all her own affairs. Then, she is in a car accident which incapacitates her for six months. How will you access digital information without passwords? 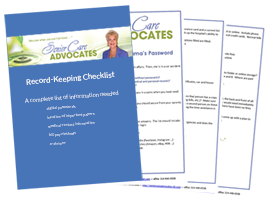 Are you knowledgeable about the location of medical and personal records? How do bills get paid? Request your free checklist so you can be prepared BEFORE it happens. Whether you are ready for a free consultation or have questions, contact us to take the next step towards caring for the elder in your life.